Hello from Sweden! I'm still on my holiday trip, but I've decided to test blogging on the go... So behold, Some Superfluous Opinions' first smartphone review! Ulriksdals slott is a Swedish royal palace built in the 17th century. The palace is complete with a theatre founded in the 1750s, today known as Ulriksdals Slottsteater Confidencen. Sitting in the old theatre, watching the rococo-style sets illuminated by candles, it was easy to imagine being a 18th century noblewoman myself. I pictured myself wearing a wig and a gown, living in a mansion. Then I pictured the shower not being invented yet, not having anesthesia or antibiotics. Probably dying of the sweating sickness as a 17-year-old. Enough of that daydream, I'm glad to live in the 21st century! However - Confidencen's production of W. A. Mozart's comic opera Così fan tutte is a lovely trip back in time that highlights the beautiful aspects of the 18th century. I suppose the charm of this piece isn't the story or the dubious moral, but Mozart's music. But I'm not an expert in opera. While I found the music beautiful and the singers talented, I was the most fascinated by how the production looked like. As I mentioned, the theatre dates back to the 18th century. It's been restored to look like it used to 250 years ago. And not only the foyer and the auditorium - it's old-fashioned all the way to the stage tech! The theatre has historical-style sets and lights. 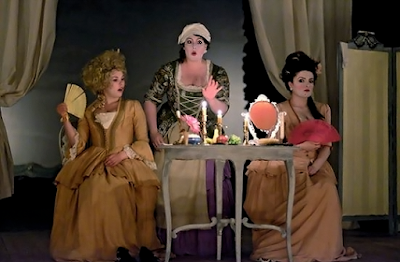 Così fan tutte is performed by candlelight. Back in the 18th century, this was a theatre fit for the queen. She probably didn't think it was anything special, an ordinary theatre just like the others. But for a modern-day commoner, the experience is enchanting. Ulriksdals Slottsteater Confidencen's Così fan tutte is well worth seeing for both the lovely music and the historical atmosphere. Experience the magic of the 18th century, with none of the plague! Pictures from Ulriksdals Slottsteater Confidencen's Facebook page.